Josh Yaro started at right center back for the Bethlehem Steel last Sunday. It was about time a loanee from Philadelphia Union did. After three consecutive games without it, the Steel and Union took steps to return proper depth to the Steel’s bench. In one game, the team had only four players on the bench. USL rules allow seven. An obvious truth has emerged: The Steel’s USL roster is too small. And this has forced Bethlehem and Philadelphia to violate one of their stated foundation principles. The organization decided to use a core USL roster size of 14 this season. Additional players would be added every game from Philadelphia Union’s roster as the first team needed. As Academy teenagers grew ready to compete among professionals, they too would join in. The actuality of in-season operational detail destroys good theories. The roster construction went well from March into June. Three-sourced depth handled preseason aches, pains, sprains and strains. Everyone’s engine capacity increased. The defense found itself and gelled, although the offense remained discontinuous. The group recovered from the shellacking in New Jersey, did well through a stretch of visiting veteran powerhouses, and anticipated the pivotal challenge of the five consecutive road trips. Then the roster shortfall emerged. The last minute injection of Copa America Centenario into the calendar was simultaneous with the group stage of “nationals’ at the end of the US Soccer Development Academy’s season. That made a mess of the goalkeeper situation. Andre Blake was away with Jamaica. Matt Jones and John McCarthy were in Talen Energy Stadium. CJ Dos Santos (U-16) and Andrew Verdi (U-18) had flown to Texas. And Samir Badr was the only keeper on the Steel bus to North Carolina. When asked who the emergency keeper had been, Bethlehem head coach Brendan Burke laughed, gently deflected by saying “Wasn’t that an interesting situation,” and low-key answered a quiet follow-up push, explaining that a one-off circumstance meant he had talked to a couple of guys about the “what-if” scenario. That would have been fine if it was a one-off. It wasn’t. There was no trained center back on the Steel’s game day bench for the three games in which utility defender Nick Bibbs started. Auston Trusty was away. Mickey Daly was loaned out. Mark McKenzie remained – and remains — hurt. When Derrick Jones’s promotion further thinned the roster in general, Anderson coming down from the Union was essential. Burke’s only center back depth was to shift a field player back and substitute into his position on the field. Credit him for having a plan. The plan was not “Next Man Up.” It could not be. There was no next man to step up. Judicious care in spending on roster salaries is sound business, but not having enough players is not. There is a difference between being caught short by a late-emerging calendar addition and taking four games to react to a problem. The means to respond existed, as the roster for the fourth, most recent game demonstrates. Why those means were not used sooner is the worst kind of question, an unanswered one. Another field player and a second goal keeper would be good answers to the roster question for the future. It turns out Matt Jones has been injured, and that’s why he was not available. If steel need another GK, how about Daly to Railhawks on full transfer (not just loan) and we get Sylvestre back. I believe Matt Jones is hurt. I think the real issue is that Anderson was a tremendous bust. Tribbett was originally supposed to be a BSteel CB and even without him Yaro could have played primarily with Steel had Anderson been a starter (and for the money paid he should have been). Along with the Edu injury and the Nogs flight, which led in part to Jones being signed to the first team this year. It’s hard to argue the back up keeper really had any impact on the team’s performance though. It hasn’t yet, but playing without a backup GK is risky business. Also, Anderson is a complete joke, and was probably one one of the worst signings in union history. “one of the worst signings in union history”? Rais MBolhi, Corben Bone and Freddy Adu would like a word with you. Porfiro. Juan Diego Gonzalez. Soumare. Talk about a competitive Rushmore! If I was doing it, I’d go M’Bolhi, Gonzalez, Adu, and M’Bolhi again. If limited to one M’Bolhi, as required by the FDA, would make space up there for Soumare. Correction: Porfiro’s hair belongs on Rushmore. Just because. Gabriel Gomez anyone? He gets into the worst conversation over guys like Myrie and Bone, who were marginal MLS talents with low salaries. This guy was (and still is somehow) on Panama’s national team and was brought in with a relatively high MLS salary and decent pedigree. That whole shady, Nowak era Latin American pipeline produced a Mt. Rushmore’s worth of busts. Nah. Gavilán could ball. Just had nobody around him during that stage of the Union’s history. Anderson is not the worst signing in Union history by far. Anderson is on a loan didn’t pan out and is likely done at the end of the season he has not impacted much in the way of roster or salary based on what the Union wanted to do anyway. He was if nothing else a risk that didn’t pan out. Rais M’Bohli was and forever will be the worst signing in Union history as he single handedly ruined the goalkeeping core, pissed off his teammates, pissed off the coach, and was one of the worst goalkeepers this team has ever seen even when we have had more than 15 goalkeepers on this team. This along with his salary and the fact that we got nothing for him all makes Rais M’Bohli the worst signing in Union history. 9 games 810 minutes played 13 GA and a record of 1w – 4l – 4t and only 17 saves. One of the worst stat lines I have ever seen. Indeed. It’s defensible to believe that M’Bolhi was purposefully trying to sabotage the team. He had one good pre-season performance. The rest of his tenure was a nightmare. I think he can be blamed for squarely for allowing Columbus to score in Oct. 2014, eliminating the Union from playoff contention. That match is still painful to recall. Josue Martinez and David Myrie would both like to have a word with you. He’s a good soccer player, MR. He would be an excellent stopper back in the old sweeper-stopper system of defensive organization. He’s not so good as a CB in a flat back four, because of speed and quickness. If the keeper gets hurt, it very likely will cost you the game, unless you are playing Our Lady of the Blind. USL matches are expendable. USL playoffs are surplus to requirements. All about that player development, of course. I’m confused as to why Yosef Samuel hasn’t been signed by Steel yet. “Reverse Read” your confusion. The Steel have not signed Yosef Samuel. Perhaps, fully acknowledge that I speculate, what does that tell you about Mr. Samuel, maybe? Who knows, maybe they will. I think it is telling, however, that he has never appeared on the Bethlehem Steel bench. The Steel have three outright strikers on their USL roster, so there has been no need, but they clearly have also had boys on the bench simply for the experience of being there. 1. He was clearly at least decent enough to get a look in preseason. 2. You are correct that he was not used by BSFC this season and the team is fairly crowded in the forward line, but he still was a full starter for the U-18s and just got capped by the U-20 national team. 3. He didn’t commit to a college. So he’s clearly looking to play professional ball. I mean the talent level is obviously there to play USL as seen by the USMNT U20 callup. They’ve put time and effort into his development, the cost of a USL contract is very very small. Hopefully, this roster limitation is partially (at least) a product of this being the first season. I remember the signings for Steel seeming coming in very late, wondering the whole time, “who is going to play on this team? !” It seems like it would be worth it to have maybe 18 USL contracted players for this reason, but I don’t know the financial viability. The other note is that this team isn’t established to dominate the USL, but to ultimate improve the first team. The roster rotation, last minute line-up adjustments, and limited benches will always be what Steel will go through if the Union have needs BSFC can accommodate. I remember thinking back in April when the number 14 seemed to emerge from observation that I thought the apparent plan made good sense if it was a little lean. But now between Daly and Jones, 14 is down to 12. Drop the number of USL contracts one more and they are ineligible to play. Auston Trusty was on what Coach Burke called a zero dollar amateur contract and has gone directly to the MLS roster. He has never been on a USL contract, which is why he is absent from this conversation. an ironic trivial touch is that the picture accompanying the text, from the 2nd game of the season at home against Cincinnati, shows only Steel players loaned from the Union. Well done Dan/Ed or Ed/Dan. Nice touch! 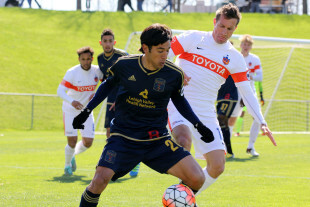 So I take it Bethlehem Steel FC’s centerback crisis will continue unabated this weekend now that the Philadelphia Union have signed Auston Trusty to a Major League Soccer contract. As we just learned when Derrick Jones was formally signed by the Union a couple of weeks ago, it takes a minimum of four days for paperwork to be completed and that means that Trusty will be banned from playing in BSFC’s USL match against the Pittsburgh Riverhounds on Saturday night. Next man up for Bare Bones BSFC, please. As a Union fan that has not really been keeping up with the BSFC situation as much as I should, this shortage of players is news to me – particularly in goal. Its too bad that BSFC couldn’t have picked up Zach Steffen for goalie when he came back to the states. He is local kid, YSC youth product and all around great guy with a ton of potential. Earnie and Jim have made some great signings. I guess that one flew under the radar.